Kasteel De Rozerie is one of the last surviving castles and manors in the region of the Dender and the so-called Land van Aalst. Unfortunately, most of these prestigious dwellings have disappeared. Kasteel De Rozerie is a magnificent country estate set at the end of a stately drive lined by centennial beeches surrounded by a beautifully landscaped park upon 18 acres of land. Nowadays this former castle can be your private home for all kinds of private and public events. At only 2 kms from the centre of Aalst and the E40, this oasis of tranquility is the ideal event venue. Its serene atmosphere, quality services, and professional staff make it a perfect location to host your corporate retreat, wedding, reception, dinner party or any other type of social event. In 1852 Kasteel De Rozerie (the former Château La Roseraie) was constructed on the ruins of an old farm. This farm belonged to a vast watercastle, the castle of Overhamme. This important castle was torn down in 1948. Cornelis Eliaert (1801-1854), industrial magnate and owner of Overhamme Castle, had this beautiful building built, which was later on called De Rozerie. In June 1889 Felix de Bethune (Aalst, 1857-1901), son of baron Paul-Valéry de Bethune (Kortrijk, 1830 – Aalst,1901), purchased the estate. His father was the founder of the Aalst branch of the well known family de Bethune. 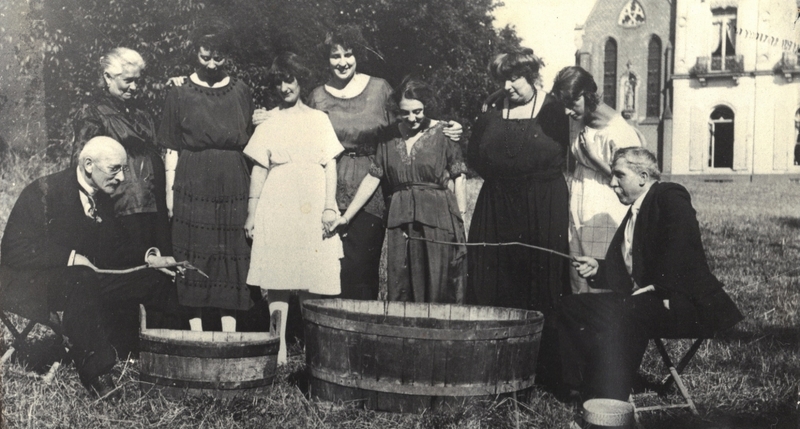 During World War I the Sisters of Charity from Wervik took refuge in Kasteel De Rozerie . They arrived in 1917 and the last sisters left La Roseraie on 1 May 1919. 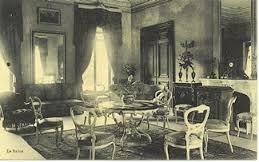 Shortly afterwards a private boarding school for young demoiselles was installed by Mr. and Mrs. M. Butaye-Coussaert. 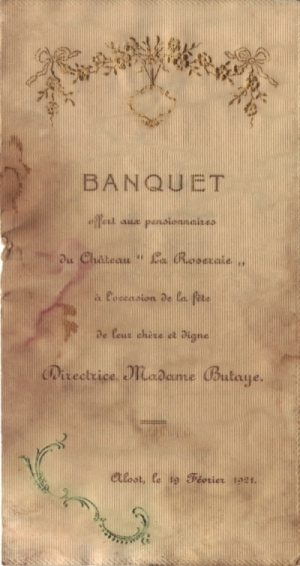 After the sudden death of Mr. Butaye in 1921, his widow moved te Spa. When his mother died in 1937, Etienne de Bethune- de Potter d’Indoye (Aalst, 1899- Bruxelles,1978), son of Felix, inhabited the estate until his death in 1978. Etienne de Bethune–de Potter d’Indoye could prove he descended from Maximilien de Bethune, Minister of Finance during the reign of Henri VI (1533-1610) and ennobled Duke of Sully. In 1936 he was adopted by Mademoiselle Gabriëlle de Sully and was called de Bethune-de Sully. The Bethune Room is named after him. Meanwhile the estate was occupied by the Deutsche Feldpost 34314 during World War II, like other important places in Aalst, such as the Castle of Overhamme and the Convent of the Capuchin Friars. In 1980 the heirs of Etienne de Bethune-de Sully sold La Roseraie to the Algeprom Ltd. The manager, Yvo Lefère, resided here for a short period of time. In 1984 this local landmark was be put up for public auction. The new owners, Dr. Vanfleteren and his wife, transformed the building and its surroundings to its new purpose with their son Bart with the utmost respect for the original. De Rozerie established itself very soon as the go-to venue for every occasion to celebrate, based on the exquisite cuisine of Bart and the warm welcome and impeccable service of his wife Rebecca. The names of the owners, their children and the architect are carved in the inauguration stone in the eastern façade of the chapel. Some unique statues decorate the entrance gate. Inside, a crafted wooden jube in the form of a swallow nest links the chapel to the upper floor. From the Eliaert Room you can enter the chapel’s balcony. In 1869 the chapel is embellished with eight splendid stained glass windows, designed by the same architect Jean-Baptiste de Bethune. An example of the finest Neo-Gothic craftsmanship executed by fourteen artisans. They represent the patron saints of the founding family. The chapel served the de Bethune family to perform every religious act, to pray, celebrate mass, baptise their newborns and bury their loved ones. 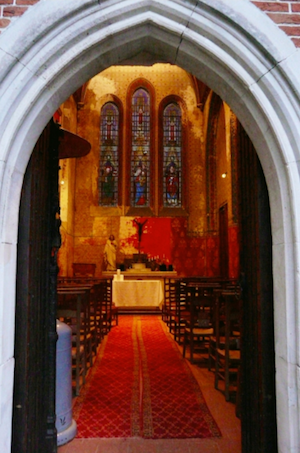 Today this picturesque chapel is available to consolidate wedding rituals, christenings and other celebrations. 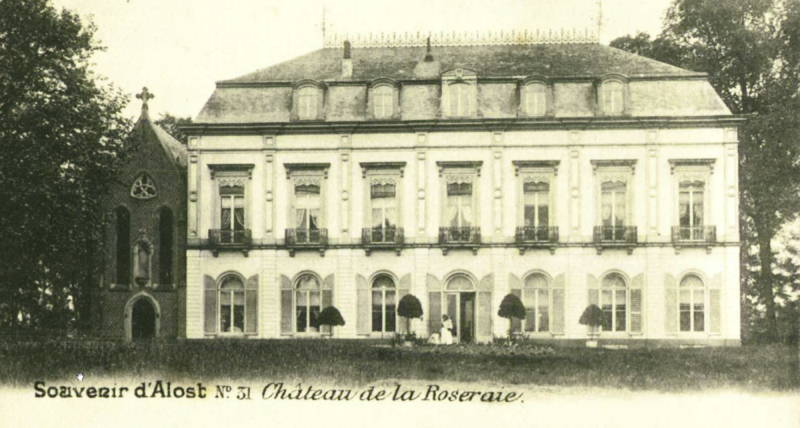 Thirty-seven years after it was built, the new owner, the baron Felix de Bethune–Maertens de Noorthout (Aalst 1857-1901), an avid cultivator of roses in his spare time , named the castle ‘la Roseraie’. His collection of roses has gone by now, but the pink blinds and the pink decorations in the façade still reflect his passion, not to mention the beautiful roses on the dinner tables.